The Fort St. George Museum was organised and opened to the public from 31st January 1948. The museum began with a small collection of objects of the British Raj donated by the then Madras Presidency Government, the St. Mary's Church authorities, the disbanded army units and others. Over the years many objects were acquired by various means and there are now 3661 registered antiquities in the collection. Best among them (602) are on display in ten galleries. The building housing the museum is one of the oldest surviving buildings built within the fort. The building was completed in 1795 and served as the location for Madras Bank. The museum building has a history of its own. 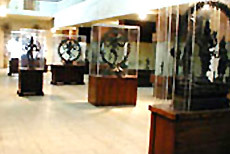 The antiquities are displayed in ten galleries spread over three floors. An imposing marble statue of Lord Cornwallis (1738-1805) greets the visitors. The statue, carved by Thomas Banks, was financed by funds raised from the public, depicts the scene of surrender of two sons of Tippu as hostages The lobby contains drawings showing the stages of constructions and renovations from 1640 onwards. Arms like swords, daggers, rifles and pistols, mortars, petard, cannon shots, breast plates, helmets, baton, and fragments of shells fired at and in defence of Madras during the freak attacks during the World Wars, besides native weapons like bow and arrow. The uniforms of various ranks of the British Army, ceremonial dress of Madras Governor's Bodyguards and the Under Secretary of Madras Government, regimental colours of various units and cushions used in the official investiture ceremony and about 64 medals and medallions issued by the British Government for honouring its soldiers in various battles they fought in the Indian sub-continent are displayed in the Uniform and Medals Gallery. Various porcelains used as official tableware by the East India Company and similar ware of the Arcot Nawabs are displayed in the Porcelain Gallery. In the Portrait Gallery, portraits, oil paintings on canvas are displayed including those of George III and his consort, Queen Victoria and Robert Clive, Sir Arthur Havelock. Another interesting, painting is the earliest depiction of Fort St. George in 1738. In the Miscellany Gallery various church silverware from the St. Mary's Church, and Zion Church, Tranquebar are displayed. The silverware of the former include the one donated by Elihu Yale, by whom, the Yale University in U.S.A was founded. There is a large-scale model of the fort as it stood in 19th century and locks and iron chests of East India Company and a palanquin of Arcot Nawabs. Objects on display in the Prints and Document Gallery include sketch prepared by the famous Thomas and his nephew William Daniell, Salt. H. Merke and others. Important among the document include few original letters written by Robert Clive and others. These prints, otherwise known as aquatints, essentially depicting Indian monuments and scenery, are laboriously prepared from an etched plate. The Indo-French Gallery contains exhibits like fine, decorated porcelain, clocks, stamps and coins issued by the French in India, furniture, lampshades and clocks. The artefacts of Wodeyars, an important native ruling family, like portraits, paintings of Mysore School, coins, flag and appreciation letters are on display in the Wodeyar’s Gallery. The prints, prepared by the Daniells and others, depicting various views of the fort, the buildings of old Madras, map of Madras are on display in the prints on Madras Gallery. These drawings throw light on the architectural history of the fort in particular and Madras and the vanished buildings in general. Besides the above various coins issued by the 'presidential and unified mints of the British, Dutch, Portuguese and Danish are on display in the coin Gallery. In the Reserve Collection there are a number antiquities among which mention may be made of the First Marriage Register of the St. Mary's Church recording the marriage of Robert Clive, the bible used by Strenysham Master, who was instrumental in the construction of the church. Timings of visit: 10.00 am to 5.00 pm.